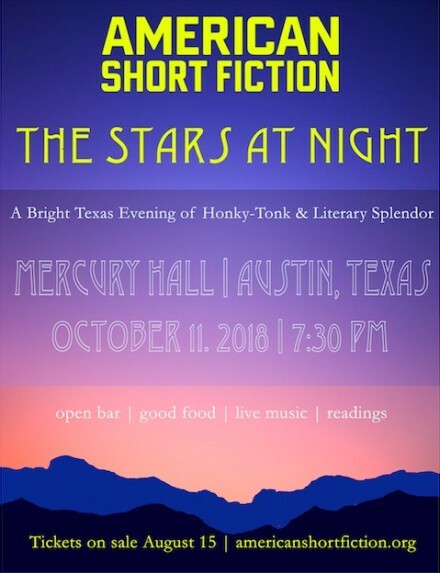 Join us on Thursday, October 11th for The Stars at Night 2018, a bright Texas evening of honky-tonk and literary splendor. Come for the live country music and readings, and stay for the open bar, delicious food from Killa Wasi, a very special live performance from the Texas country songwriting legend Butch Hancock of The Flatlanders, and the historic charms of Mercury Hall, complete with beautiful gardens and rambling live oaks on a bright starry lawn. Mark the date on your calendar and shine those cowboy boots—it's an evening you don't want to miss! The Stars at Night will kick off at 6:30 p.m. with a VIP party featuring our honorees and other writerly luminaries. VIP guests will receive a gift bag with a limited edition poster, signed editions of some of our honorees' books, including Literary Star Laura van den Berg's The Third Hotel, Emerging Star Fernando A. Flores's Tears of the Truffle Pig, and Gold Star Elizabeth McCracken's upcoming novel, Bowlaway, as well a other swag! General admission begins at 7:30 p.m.
— The award-winning author Laura van den Berg will be our Literary Star award for her exquisite new novel The Third Hotel. — Elizabeth McCracken, a masterful writer in her own right, will be our Gold Star for outstanding teaching and mentorship. — Fernando A. Flores, an up-and-coming writer with two books on the way, will be our Texas Emerging Star. 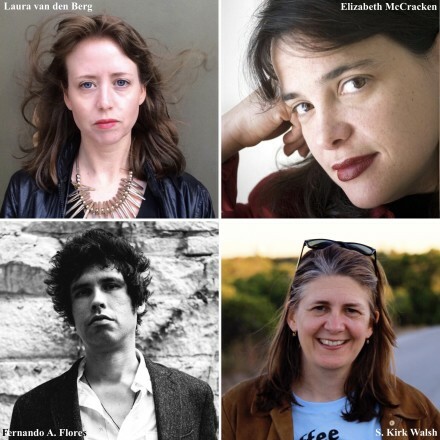 — S. Kirk Walsh, the founder of Austin Bat Cave and leader of the 9-month workshop, will be our Community Star for her generous service to Austin's literary legions. You can read more about our fantastic honorees here. The evening will also feature a very special live performance by the Texas country music legend Butch Hancock! Mercury Hall is located on Cardinal Lane off South 1st Street and in between Oltorf and HWY 290. Its address is: 615 Cardinal Lane, Austin, TX 78704. There is no age limit to enter the event, but you must be at least 21 years old with a valid ID to be served alcohol. There is limited parking for 75 cars at the event (45 in the main lot and 30 in the overflow lot at 3504 S. First Street). We encourage you to carpool. There is also parking on neighborhood streets. We would like to thank our sponsors: The Michener Center for Writers, FSG Originals, Topo Chico, Killa Wasi, The LINE Hotel, Thirsty Planet Brewing Company, Tito's Vodka, and Tequila 512. Higher level individual, corporate, and in-kind sponsorships are available and most welcome. For complete details and benefits of donating to American Short Fiction, contact us at editors@americanshortfiction.org.